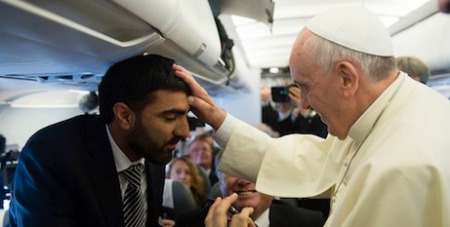 Pope Francis has directly addressed the issue of priest celibacy for the first time since his election as Pope while on his way back from a historic trip to the Middle East, reports The Huffington Post on Ucanews. During his chat with reporters, Pope Francis took the opportunity to condemn sexual abuse by priests. He has created a commission to investigate abuse by clerics and institute reforms, though the UN has harshly criticised the Vatican for its current set of policies. Some proponents of optional celibacy link priest abuse to sexual frustration, arguing that less abuse would occur if celibacy was not mandatory. However, the Church rejects this argument, claiming that abuse happens due to psychological problems, reports The Times of Malta.